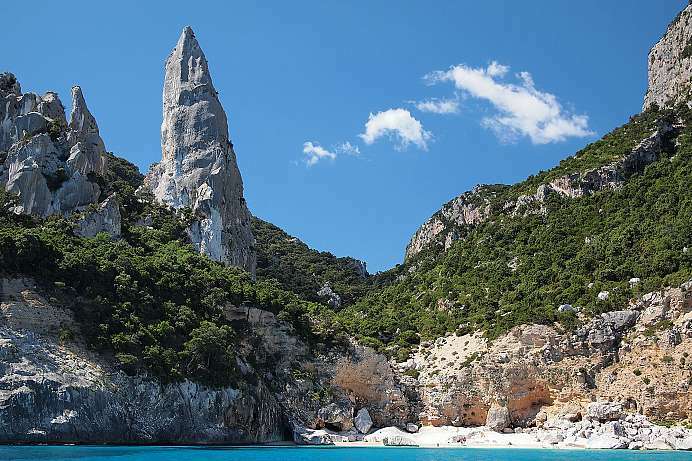 Sardinia: White and fine-grained are the beaches, picturesque the bays, which are often divided by bizarre rocks. But most impressive is the sea. It is turquoise – as in other parts of the Mediterranean. But here, it shines. Around Sardinia, a turquoise sea shines. 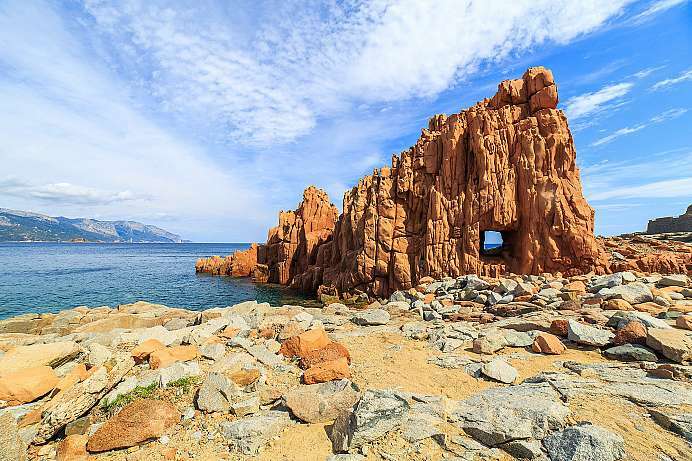 But Sardinia is more than just a bathing island: archaic villages, national parks, holm-oak forests and scrubland and, of course, the nuraghi lure you inside: enigmatic towers from prehistoric times that prove one thing: Sardinia has always been a small cosmos in itself. 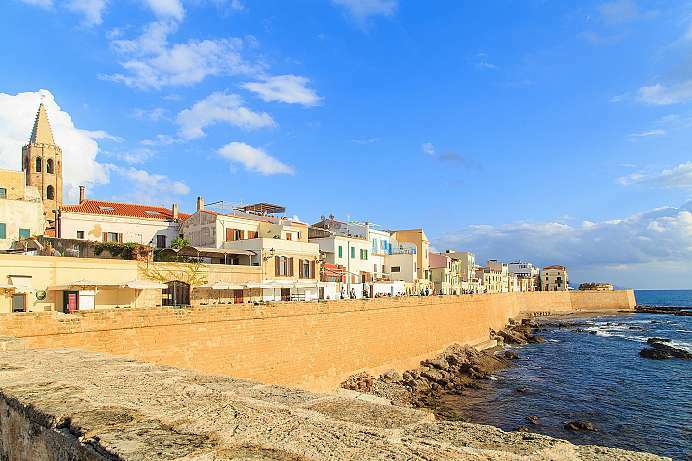 Alghero's history as a resort began when the House of Savoy established a residence there around 1900. From the westernmost city in Sardinia it is only 300 nautical miles to Barcelona, which explains the strong Spanish influence still reflected in the dual-language street signs. The vibrant old town is a marvelous place to take a stroll, and there are numerous excellent beaches in the area around the city. A tour of the mainly Gothic old town is best started at the Piazza de Porta Terra. Walking along Via Roma you will reach the Cathedral of Santa Maria, a conglomeration of architectural ideas and styles. From the octagonal bell tower one can admire the views across the old town. The interior of the cathedral is also worth seeing and contains amongst other works of art, a reliquary with the remains of a newborn, which is supposed to have fallen victim to the murderous doings of King Herod. The trail continues south to the house of Doria and the Curia Palace Palazzo Machin, the former seat of the bishop of Alghero. Passing the theater one arrives at the Chiesa della Misericordia, a simple religious building from the 17th century. 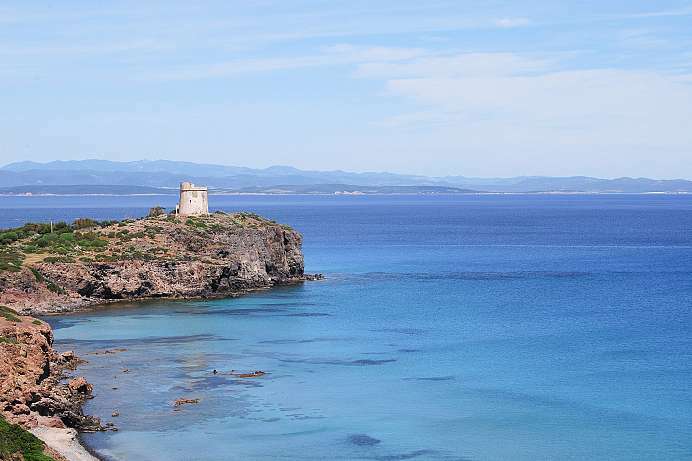 Continuing the tour westward, one reaches the waterfront, which presents an impressive view of the Bay of Alghero. Via the palmfringed Bastioni Magellano, continuing along the harbor, the route leads to the Porta a Mare. Back in the old town you will find yourself on the very lively Piazza Civica, which is dominated by the impressive facade of the Palazzo d'Albis o de Ferrera. This is where Charles V, Emperor of the Holy Roman Empire, is said to have spoken from a window to his people in 1541. After all these enormous, historical impressions one can relax very stylishly in one of the lovely cafes in the Piazza. 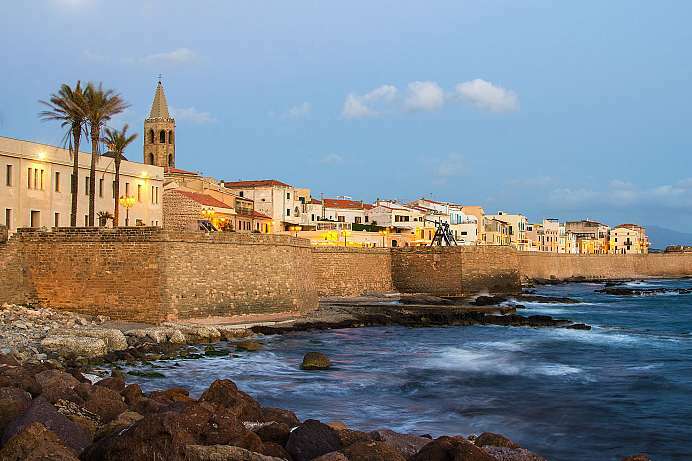 Also the city walls and bastions of Alghero are worth a visit. During a walk along the top of the wall you can enjoy the magnificent sea views. 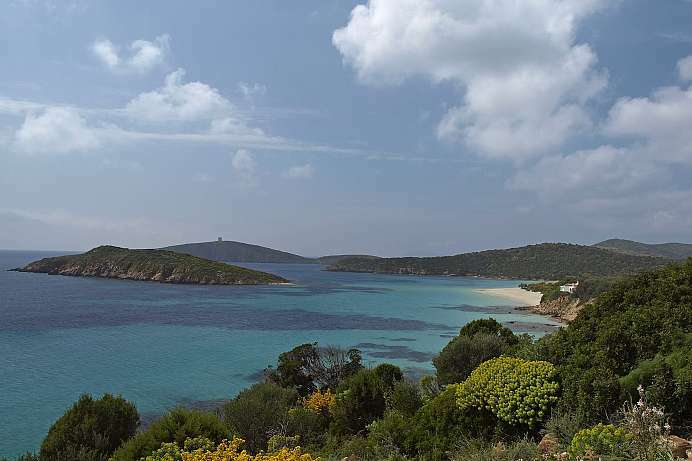 Arbatax is located on a peninsula that juts out from Tortoli. 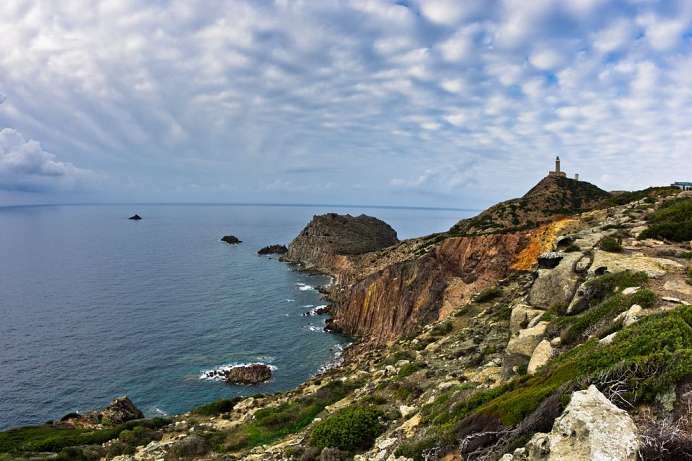 The town is known for its sandstone cliffs, which are best viewed from the lighthouse at Capo Bellavista. The nearby industrial plants distract somewhat from the otherwise pleasant atmosphere of the resort. Ferries depart from Arbatax to various destinations on the Italian mainland. A popular activity is a ride on the “Trenino Verde” (Little Green Train) to the scenic highlands in the interior. 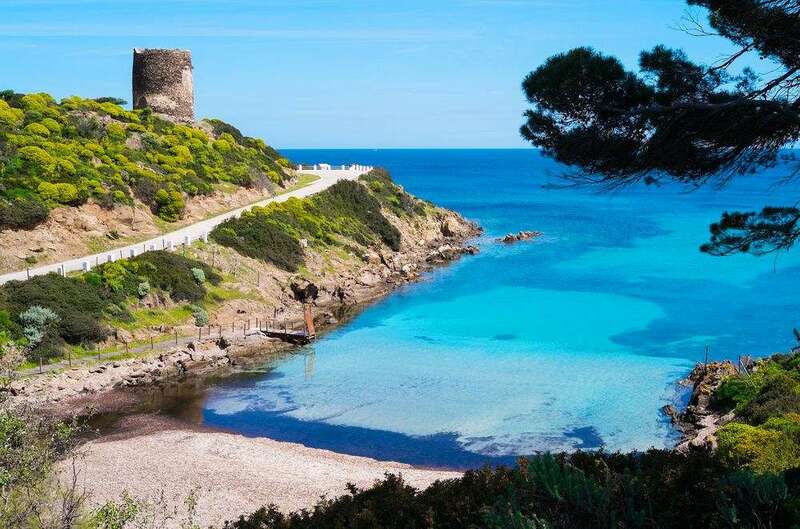 Sardinia's capital with its 196,000 inhabitants is located on the south coast of the island in the shadow of the Castello, whose mighty walls conceal a quaint, somewhat dilapidated old town. Narrow lanes lead to secluded spots, hidden churches and venerable palazzi. The marble staircase leads to the panoramic terrace Umberto I, from which one overlooks the harbor, the gulf and the sea of houses. Outside the old town Cagliari is a typical southern-Italian city with interesting shops and good restaurants, but also bleak suburbs, ugly new buildings and heavy traffic. 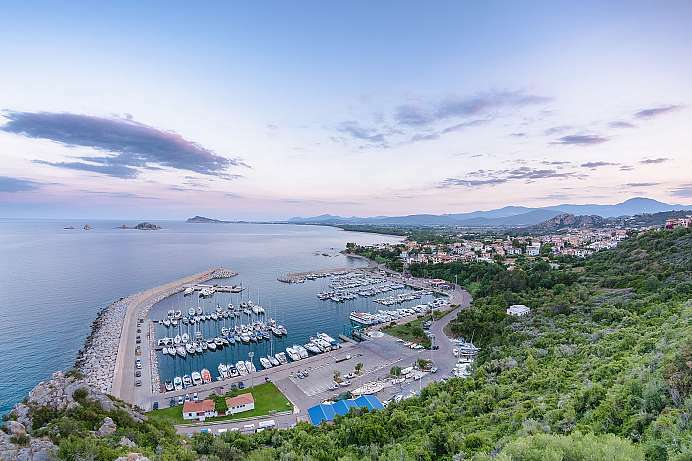 From the southernmost tip of the island of Sant'Antioco, one has a breathtaking view of the Isola della Vacca, the Isola del Vitellino and on a good day even the Isola del Toro – all of them being former volcanoes, which stand out from the sea. From the Cape you can reach other bays with crystal clear water that glistens in the sun, as the rays are reflected back from the seabed. The diverse marine life makes the beach a popular destination for divers. The only village on the otherwise uninhabited island of San Pietro has a fascinating history which begins in Pegli near Genoa. In 1542 some residents of the Ligurian coastal town set out to settle in Tabarka in Tunisia, trying to make their fortunes as pearl divers. There, they preserved their Genoese dialect and their culture for nearly 200 years until life became impossible due to continued pirate attacks. 1738 they finally accepted the invitation of King Charles to establish a settlement on the uninhabited island of San Pietro. In honor of the King they named it “Carloforte” (strong Charles). Even today, the islanders speak their ancient dialect, which has long since disappeared in Genoa. 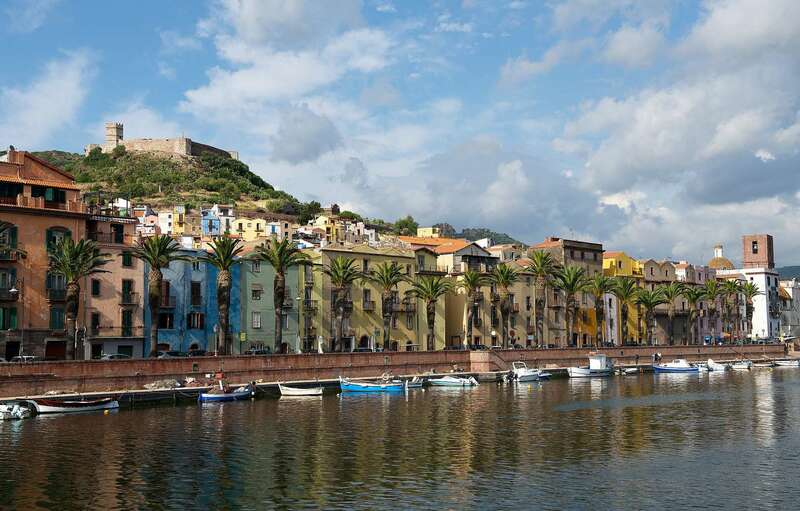 Also architecture, culture and customs of the town are Ligurian and differ significantly from the rest of Sardinia. 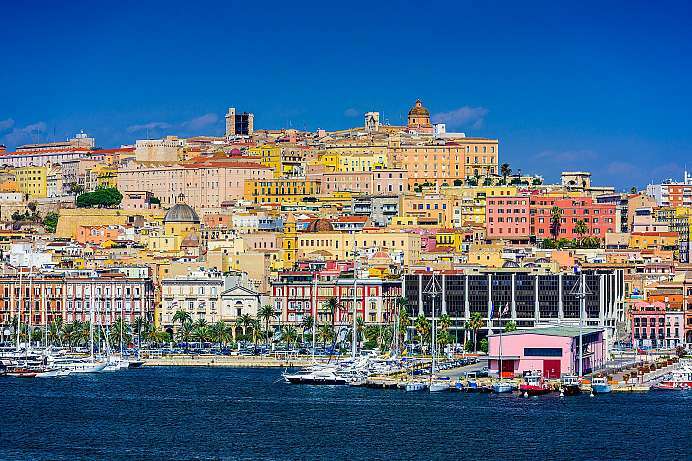 Cagliari's old town, also known as “Casteddu” amongst locals, is still largely preserved in its medieval structure. Dark, narrow streets are lined with dilapidated houses: the stucco is crumbling and balcony railings are rusting. Castello's morbid charm, however, won't be around for much longer. For the past few years, the former nobel district has been renovated extensively. After its degeneration in recent decades and becoming a slum, now more and more prosperous tenants return to the newly renovated palazzi. From the Terrazza Umberto I you come to a marble staircase. There awaits a great view across the harbor and the Golfo del Angeli. 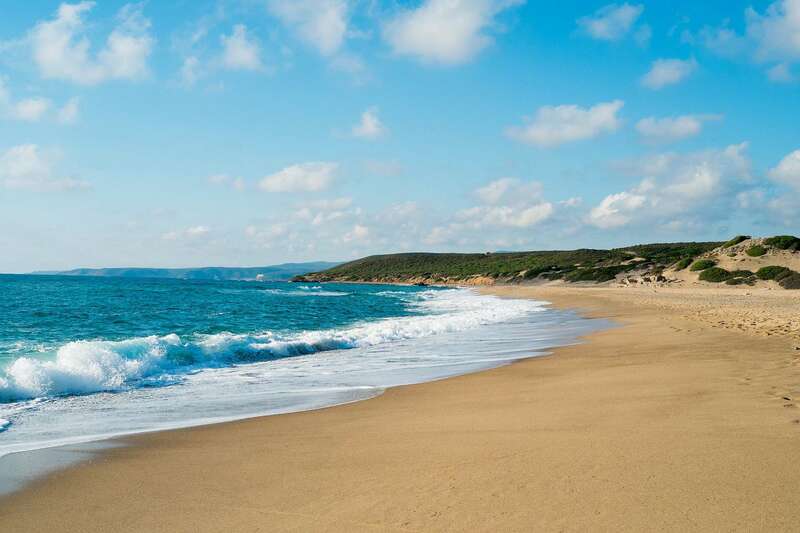 The southern coast extends between Capo Teulada, the southernmost point of Sardinia in the west, and the town of Santa Margherita di Pula in the east. Smaller and larger bays alternate with rocky headlands of granite and sandstone. Besides the Roman city of Nora, the Grotto Is Zuddas with its unique limestone formations is part of it as well. 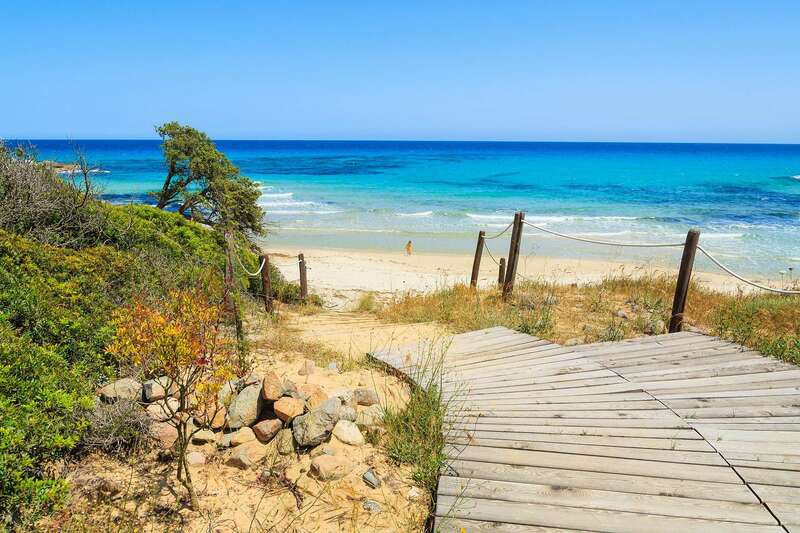 The beaches are less populated than in other parts of Sardinia. 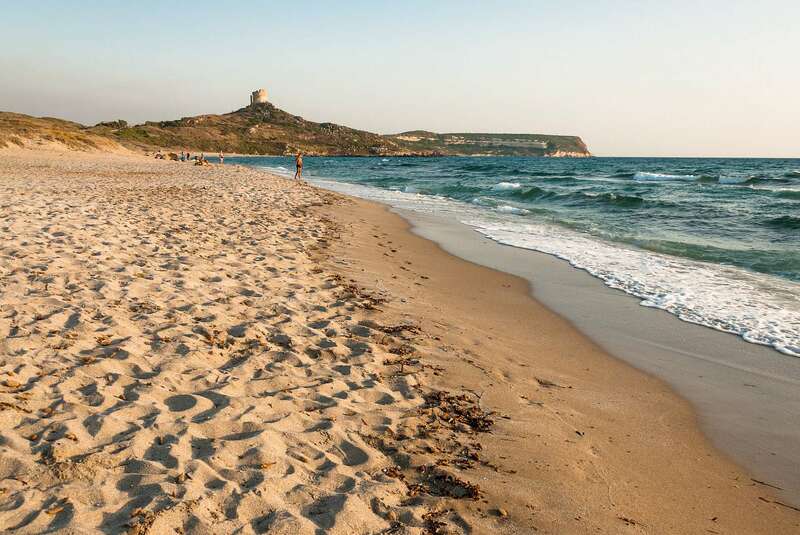 Among the most beautiful are the Spiaggia di Nora, whose soft sand was already appreciated by the Phoenicians, the beach of Santa Margherita di Pula and the rocky cove Cala Chia. 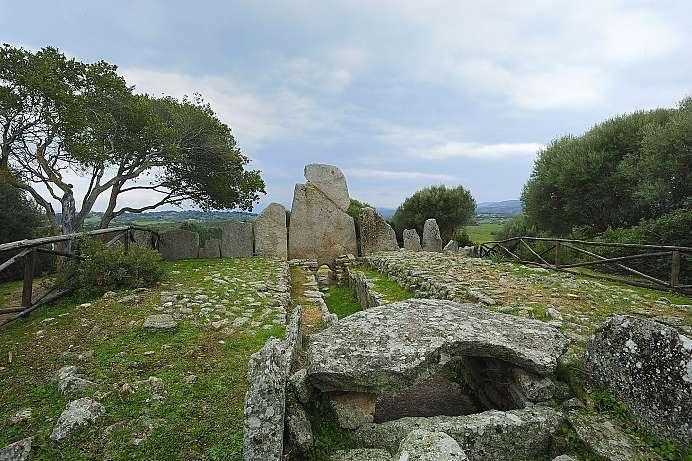 The giants grave near Arzachena rises above a flat, confined by granite rocks. It is 27 meters long. A megalithic stele of four meters in height forms the center. The grave probably belongs to the neighboring village of Nuraghe Lu Naracu, 1.5 kilometers away. 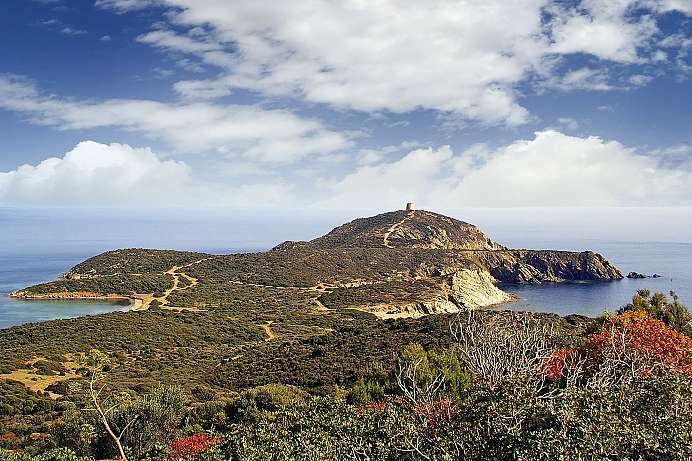 In total there are 321 giants' tombs in Sardinia. They all date back to the Bronze Age around 2200-1600 BC, making them older than the Nuraghic culture. The cave system at the foot of the Supramonte, in the Golf of Orosei, owes its name to the monk seals that lived in the seawater tunnels up to the 1980's. Today, these animals that can grow up to three meters long and weigh nearly 350 kg have largely disappeared. Approximately 900 meters of the underwater cave can be visited. Inside are a few rock engravings of dancing people that supposedly date back to Neolithic times. 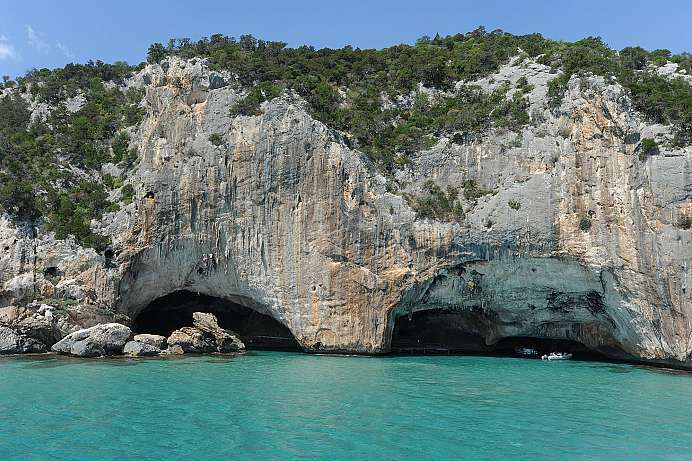 The Grotta del Bue Marino can only be reached by boat. The road leading south along the coast from the resort of Cala Gonone ends a few hundred meters before the cave. 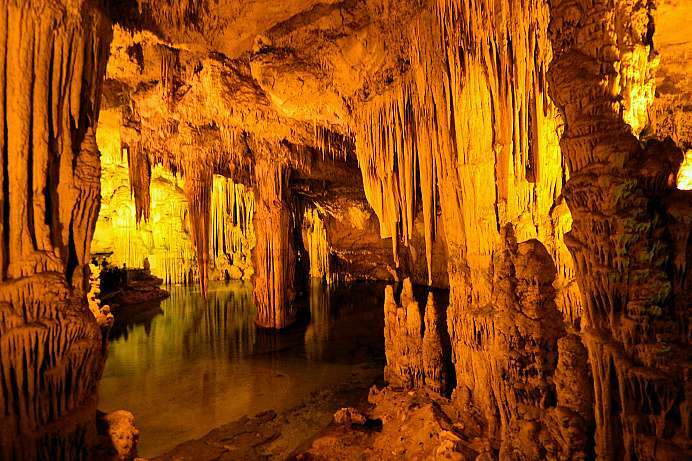 The stalactite cave is one of the most beautiful of the Mediterranean. It is located one meter above sea level, at the foot of a 110 meter high and very steep cliff. 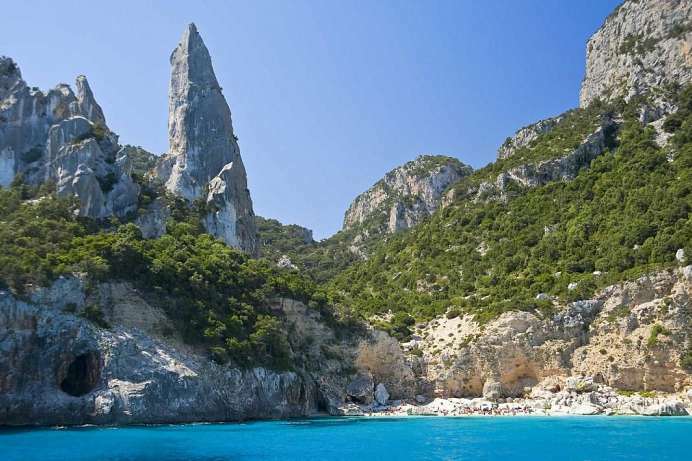 Only when the sea is calm it can be reached via a staircase, its 654 steps carved into the cliff. Alternatively, you can also take a less strenuous boat tour from Alghero or a nearby car park. Of the widely ramified, about 4 km long cave system only a few hundred meters are open to the public. During the tour stalactite formations, travertine deposits and a small saltwater lake, about 120 m long and connected with the sea, can be visited. Explanations are made via permanently installed speakers in Italian and English. This Nuragic holy well dating from the 10th century BC is located at the edge of the Giara di Serri plateau, which happens to offer a fantastic view of the surrounding area. More than 50 holy wells have been found on Sardinia. Because water was scarce in the Sardinian mountains, it was highly prized by the Nuragic civilization. Springs, wells and other sources of water were worshiped as the source of life and growth. 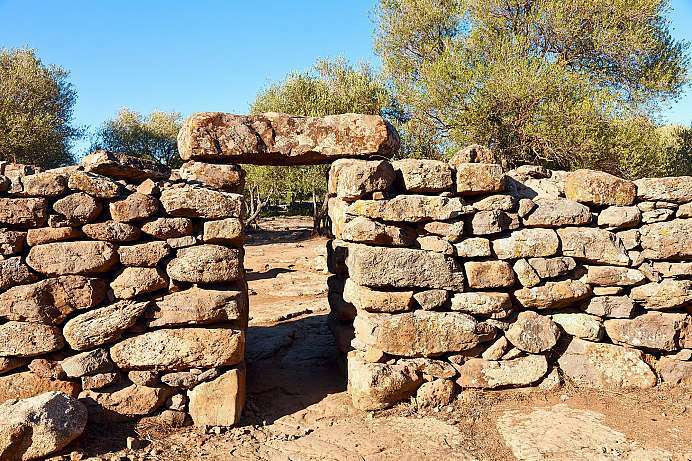 The Nuragic Sardinians erected water shrines wherever water happened to bubble up out of ground. Santa Vittoria is one of the largest such sites, and it is still in good condition. 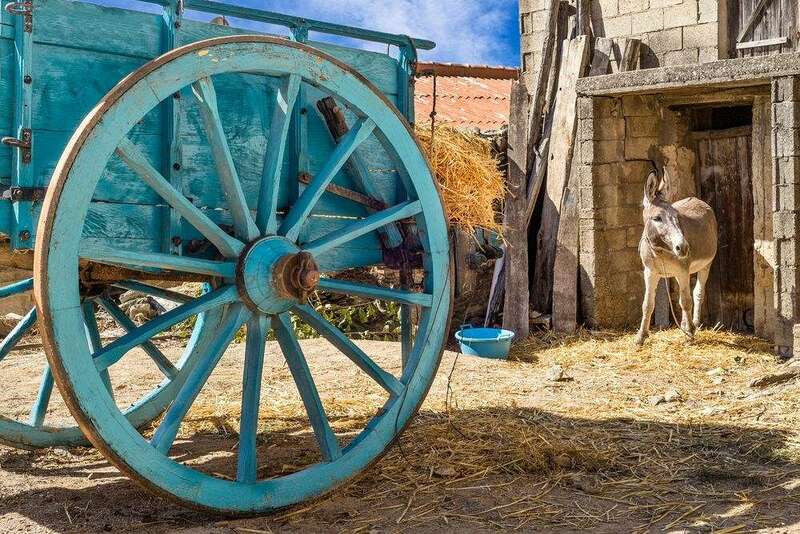 It consists of a small modern church and more than 50 prehistoric structures, including a number of round huts probably used to house pilgrims. The actual holy well of Santa Vittoria is the oldest structure on the site. A narrow stairway leads down into the three meter deep well schaft. 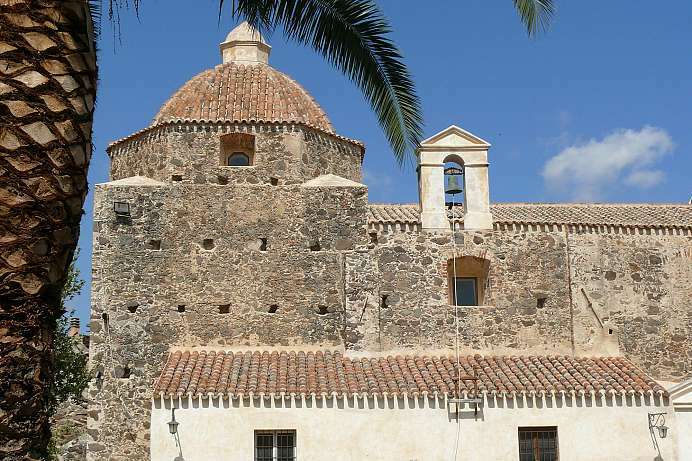 Santa Vittoria is a fascinating testimony to the culture of the Nuragic Sardinians and offers its visitors a glimpse into this people's religious imagination. 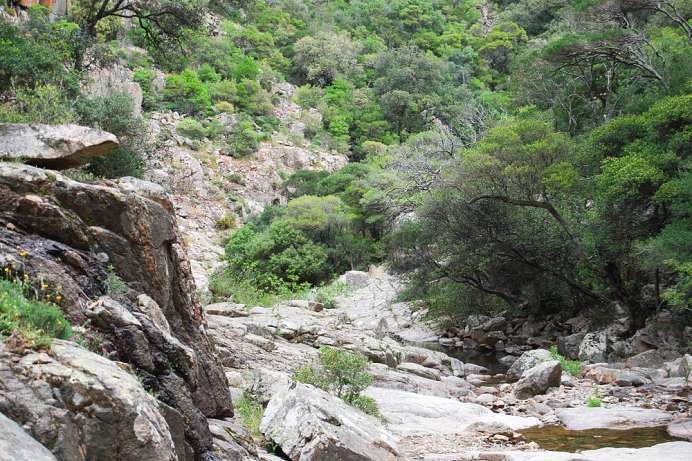 If combined with a trip to the Sardinian plateau of Giara di Serri, you will also be able to a enjoy the area's natural beauty and the extraordinary view. 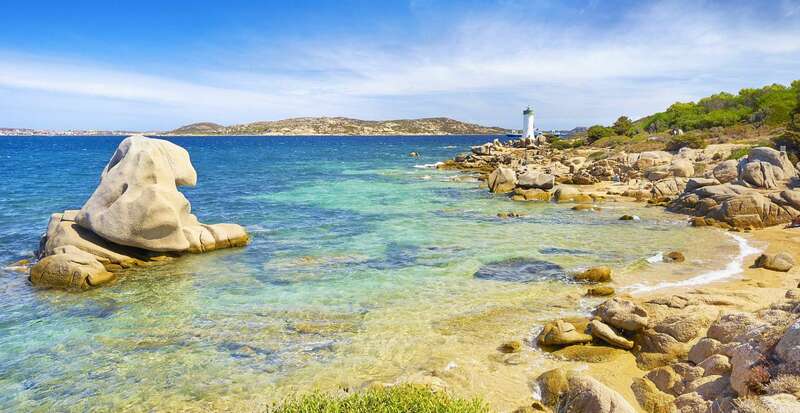 The largest island off the coast of Sardinia is situated three km from the southwest tip and can be reached over a man-made dam first constructed by the Carthaginians over 2,000 years ago. 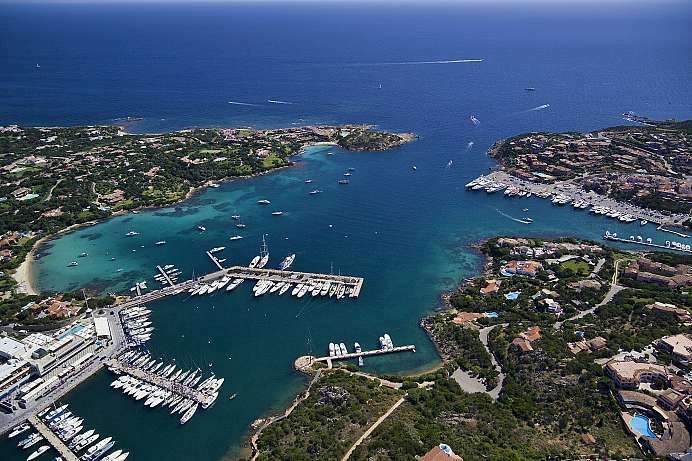 Only two small cities are located on the island, which has a land mass of 109 km²: Sant'Antioco and Calasetta. All the other settlements are only inhabited during the summer months. 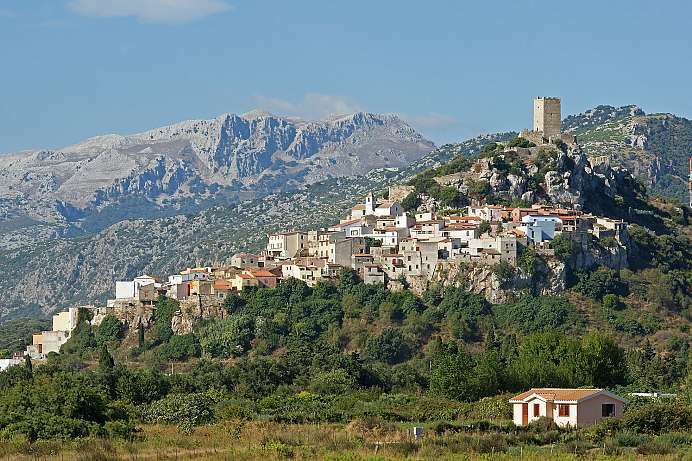 Sant'Antioco, an ancient city founded by the Phoenicians, lies at the foot of a huge mountain. A vast network of catacombs underneath the town testify to its importance in antiquity. The catacombs can be accessed from the basement of the Basilica and the grottos at the Archaeological Museum. Boat excursions to the islands farther west can be taken from Calasetta. 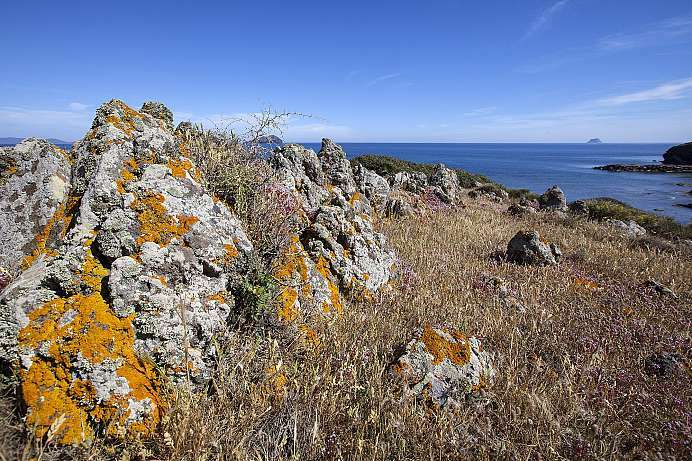 Sant'Antioco has few sandy beaches but visitors enjoy exploring the cliffs and hiking through the grasslands. 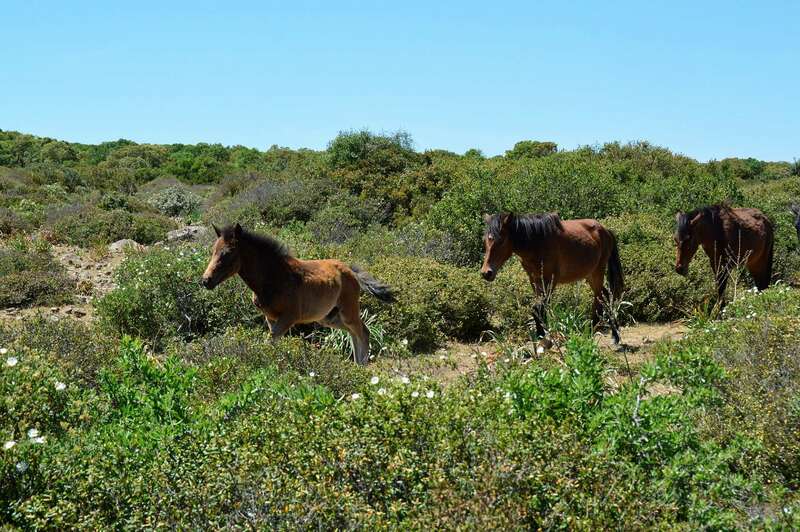 Just a few km back of the northern coast is a stark mountain landscape far removed from the mundane world of tourism: bare, rugged cliffs jut up from a thick undergrowth of shrubs called “macchia” (chaparral). Farther into the Limbara Mountains the road is lined with deciduous forests of cork, holm and oak. 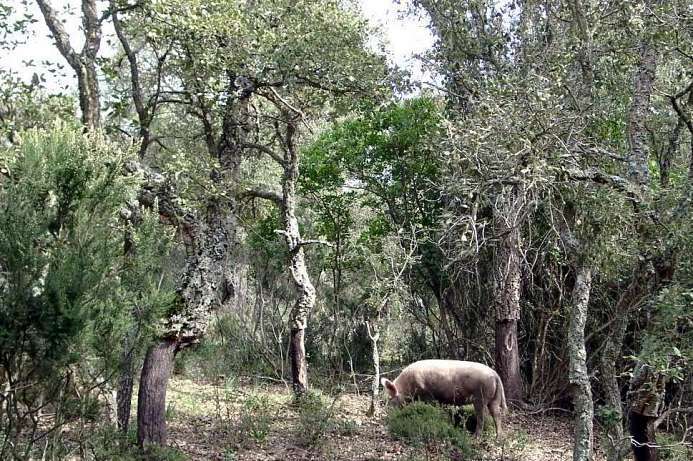 Hikers on the way to mountain-top viewpoints and deep valleys will encounter wild boar more often than they'd like. 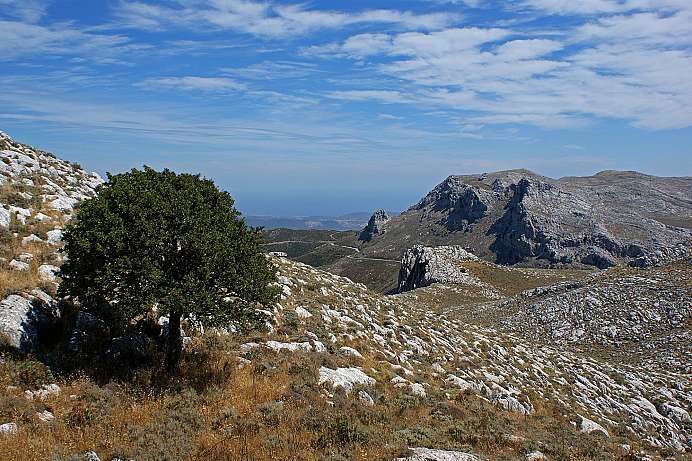 The oldest olive tree in Italy stands near Lauras: it is believed to be 3,000 to 4,000 years old. 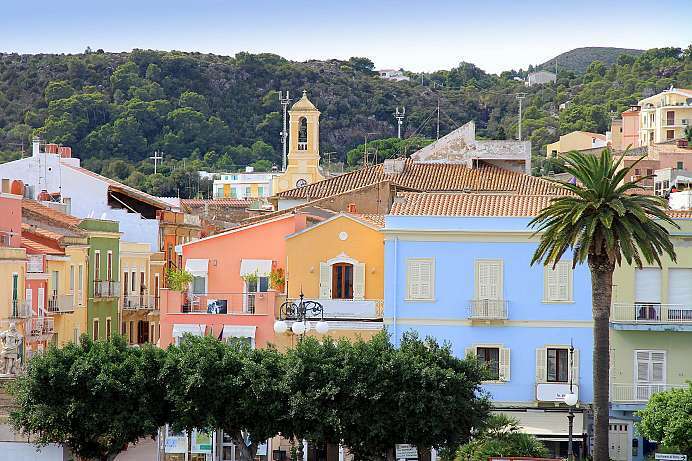 The city in the southernmost part of Sardinia is probably the oldest on the island and older than Rome. It was founded by Phoenician sailors in the 9th century BC. The Nora stele, with an inscription in which for the first time in history the name “Sardinia” appears, dates back to this period. Today, however, it is on display at the National Museum in Cagliari. The town was often built over, so that today's ruins “only” date back to the 3rd century BC. Among them a former theater, a temple, baths and private villas. Guided tours are available. 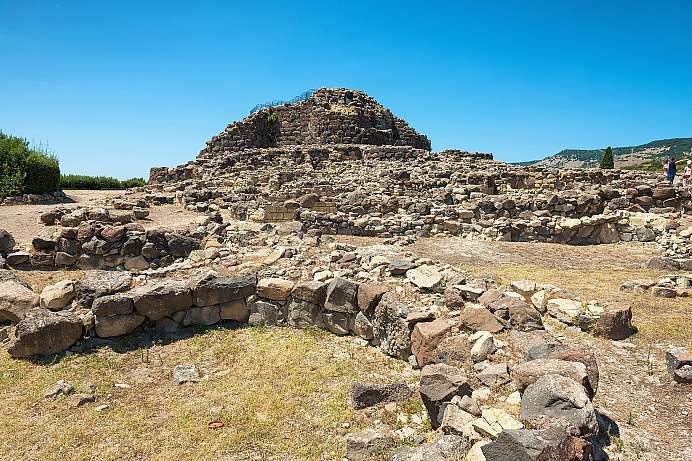 Sardinia's prehistoric towers dating back to the Bronze Age are called Nuraghi. They served as places of worship, castles or tombs. The complex on the hill of Genna Maria, however, was a whole village. The central tower dates back to roughly 1350 BC and was added to about 300 years later in form of round buildings, so-called Tholoi. In order to secure the site it was surrounded by a wall with loop-hole openings. Inside there was a well. In the 8th century BC, the inhabitants must have fled the idyllic village. Whatever the reason is unknown. Besides Cagliari the city of Olbia on the northeast coast of Sardinia is the second center of shipping traffic. 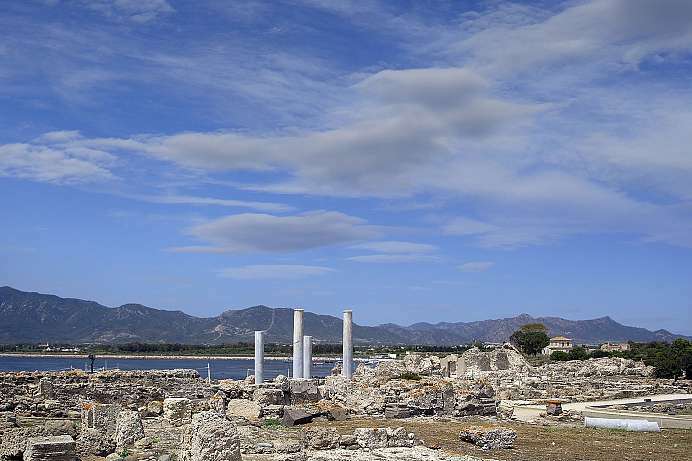 Although a settlement was founded on this site by the Greeks in the 6th century BC, the city has virtually no historic structure and no point of interest to offer. In the 1960s, due to the port and the industrialization the population grew rapidly, which is why functional suburban developments were stomped out of the ground. Many historic buildings lying on a circular route bear witness to the early importance of this sleepy town. In the Middle Ages the town was fortified with a wall and a castle. From the 16th century onwards pirate raids and malaria (the mosquitos carrying the disease thriving in the nearby swamps) contributed to its demise. Today there is a reservoir to irrigate the agricultural lands. There is a long sandy beach on the coast. The picturesque old town is already visible from afar. It is built around a panorama mountain that is crowned by the ruin of a castle. But only the massive square tower remains from the Castello della Fava. When strolling through the old town, one discovers hidden courtyards and, often only reached by alleys and stairs, enchanted places where time seems to have stood still. 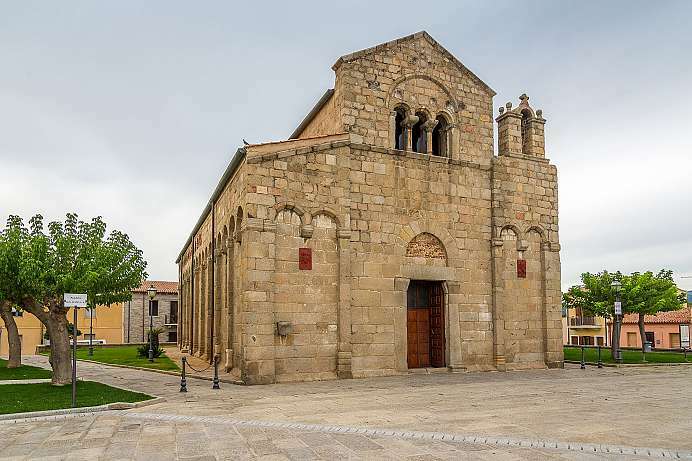 The Romanesque basilica in Olbia is named after the oldest bishop of Sardinia. The church is the largest architectural gem of Gallura, although it seems simpler than other Romanesque churches on the island. On the walls are milestones of a Roman road and also grave stones. This city was founded in the Middle Ages by residents of Porto Torres who wanted to avoid pirate raids by moving inland. 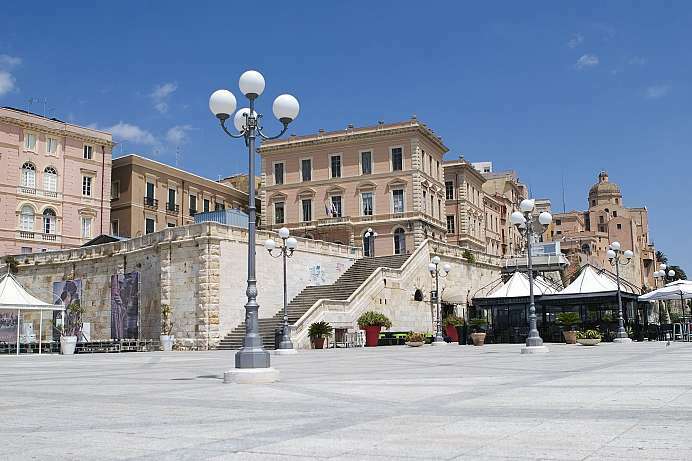 Today, Sassari is the second largest city in Sardinia. It has a university and several famous squares. The old town is especially charming with its winding allies located between the cathedral square and the Piazza d'Italia. 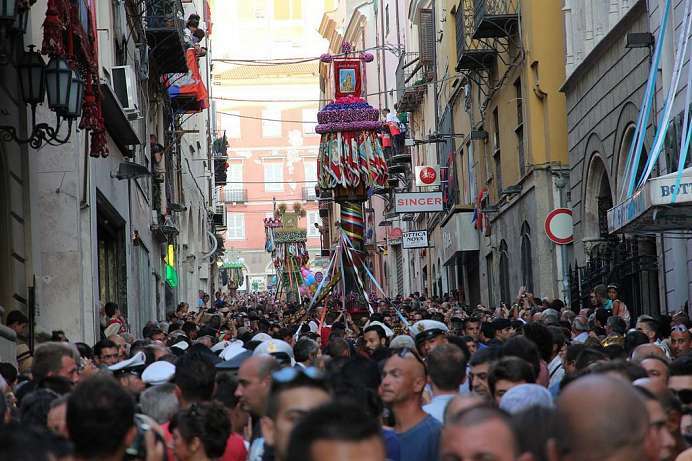 The city has its most important festival on August 14, the Faradda di li Candelieri, a Marian feast day that has been celebrated since the Middle Ages in order to ward off the plague. The “valley of the moon” is a plateau near Aggius – not be confused with the hippie colony of the same name near Capo Testa. 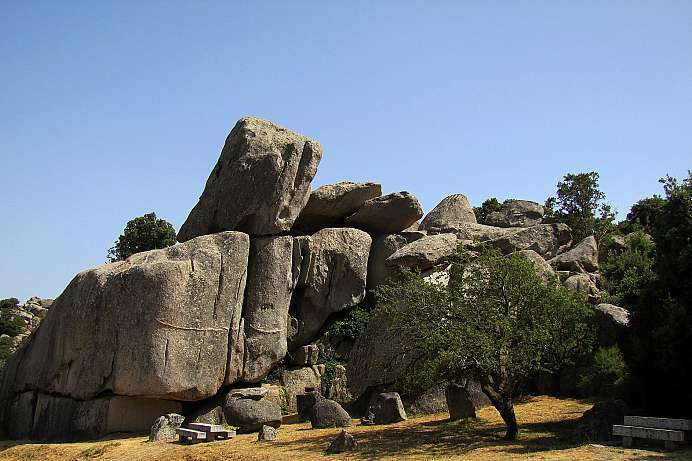 During the last ice age on Sardinia, glaciers swept granite boulders the size of houses into piled rock formations. Today, this “moonsacpe” is covered in ochre and crimson lichen, blackberry bushes, myrtle hedges, genista and blackthorn bushes.